Fairy Falls is a tall, slender waterfall that is worth the level hike to its base. 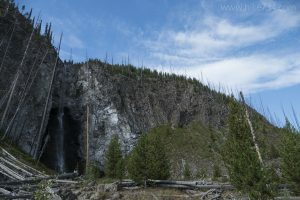 This popular trail crosses over the Firehole River on the old freight road and travels along the base of the surrounding hills. After passing a few springs that empty into the river, you follow along the eastern edge of the Midway Geyser Basin. This gives you a different perspective of the Grand Prismatic Spring than from the boardwalk. A short spur trail heads up the hill to give you a wonderful vantage overlooking the spring. Return to the road and continue on, past the spring, where a signed trail for the falls takes off to the left and heads east. You travel through a young stand of lodgepole pines with very limited views for 1.5mi/2.4km to the waterfall. The trail goes up to the base of this delicate waterfall that falls 200ft/60m over a rocky cliff. Continue on the trail and take a left up the Fairy Creek Trail for 0.3mi/0.5km past the Spray Geyser to the Imperial Geyser which is a beautiful, active geyser. Turn around and return to the Fairy Falls Trail. Return the way you came or take a left to loop through Imperial Meadows for an additional 2.9mi/3.2km through open meadows with more springs. 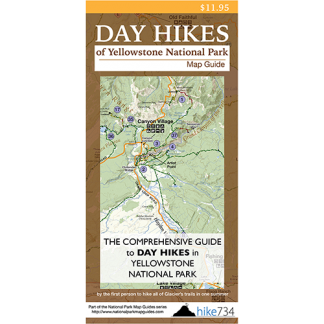 This option will take you past a quaint pond and a pretty stretch of the Firehole River when the trail joins up with the freight road. Trailhead: The signed trailhead for Fairy Falls is located on the Grand Loop Road between Midway Geyser Basin and Old Faithful.